Each living cell is densely packed with microscopically small proteins, which as molecular machines perform a variety of tasks. They copy DNA, produce new proteins and generally ensure that the cell does what it must do. How do proteins do that precisely? Eight FOM research groups that are specialised in the physical properties of protein machines have joined forces to study how proteins behave in the context of the living cell. Over the past ten years a lot of research has been done into the physical mechanisms that underlie the functioning of protein motors. Thanks in part to FOM funding, the Netherlands has acquired a top position in the development and use of single-molecule techniques that allow researchers to influence and control individual protein motors. This approach has resulted in an enormous growth of knowledge about exactly how these molecules work. The current research is mainly realised on proteins isolated in aqueous solutions without the dense packaging of proteins, DNA, lipids and other macromolecules found in a cell. To understand how protein motors do their job in their usual environment within the cell, researchers need to develop new experimental approaches. With such methods physicists can study the physical properties of these motors, such as speeds and forces exerted, and can also do this in densely packed environments. The researchers will focus on the class of protein motors that work on DNA, such as the proteins responsible for copying and reading out the genetic information. They will investigate these biological systems in environments with different types of complexity, which jointly simulate the cell environment. In these environments, protein obstacles occur on the DNA, solutions are densely packed with biopolymers of various dimensions, and the DNA is packaged and structured like in a chromosome. With this approach the researchers hope to close the gap between a detailed and quantitative understanding of how proteins work on the one hand and the phenomena caused at a cellular level by these same proteins on the other. 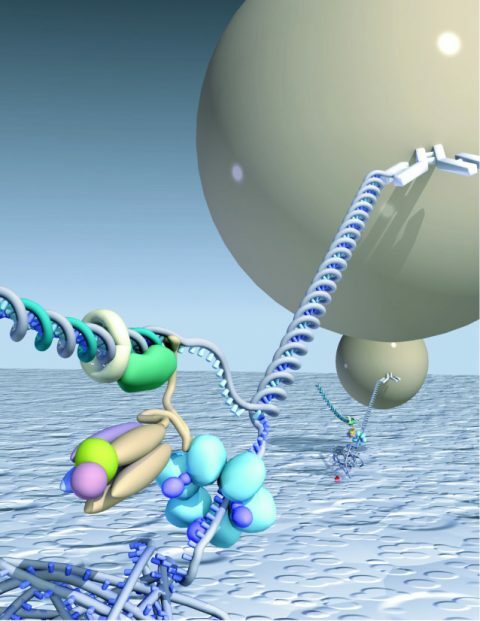 Artist's impression of a single-molecule experiment in which a complex of protein motors together copies a DNA strand. The ball at the end of the DNA is used as a handle to exert force on the DNA and to stretch it.